California continues to lead the nation in developing standards for advanced clean, zero emissions, vehicles from cars up to big trucks. Today the California Air Resources Board (CARB) passed new regulations that could help shape the future of the automotive industry. Previous era’s of California’s clean air regulations have both made California’s air cleaner, and have acted to drive development of generations of cleaner vehicles. The Advanced Clean Cars program approved yesterday by the Air Resources Board is a single coordinated package of requirements for model years 2017 through 2025 meant to provide a wide range of benefits including cleaner air. The range of benefits cited by CARB include: Consumer Savings, fuel cost and operational savings with “nearly $6,000 in fuel cost savings over the life of the car” by 2025; Fight Smog and Climate Change, from a 75 percent reduction in smog-forming emissions and 34 percent cut in greenhouse gas emissions; Deliver Next-Generation Cars, by 2025 over 1.4 million zero-emission and plug-in hybrid vehicles will be on the road and will be 15.4 percent of new car sales; Create Jobs, with 21,000 new jobs in California by 2025. Unlike previous era’s of California’s clean vehicle regulations, the new standards were developed jointly with Federal regulators. 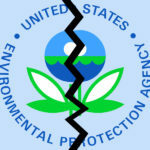 The Obama administration proposed increased CAFE standards and other regulations last summer, to which CARB says “Once the proposed federal standards are adopted, they will be deemed sufficient for compliance in California.” Auto-makers should see this as an advantage in no longer having to build California-specific versions of their vehicles. Environmental goals at both Federal and California level require reduction of smog-forming pollution by an additional 75 percent from 2014 levels. With over 26 million cars on the road reducing pollution from those cars is a high priority means to meeting the tougher requirements coming in the future. 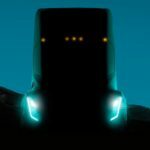 The new regulations, known as LEV III, will drive development of the cleanest internal combustion engined vehicles ever seen. 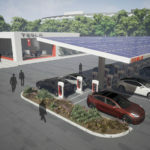 The new requirements are expected to usher in wide ranging adoption of zero emission vehicles up to 87% of California’s car fleet, with a dramatic upswing in use of not only battery electric vehicles but even fuel cell vehicles. CARB’s expectation is that half of the cars sold in California will be fuel cell driven with another 30 percent or so will be battery electric. Meeting this level of fuel cell vehicle sales will require more disruption and change than will meeting high levels of battery electric vehicle sales. Fuel cell vehicles will require a whole new hydrogen delivery infrastructure to be built, whereas battery electric vehicles can reuse the existing electric grid especially as improvements are put into place as the smart grid develops. Fuel cell vehicles are being incentivized by awarding more ZEV Credits than they do today, to add more incentives for their adoption. 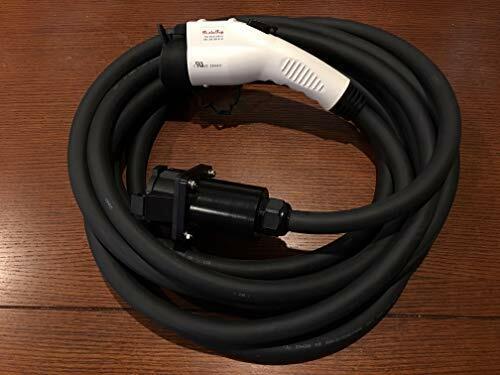 CARB has also added a new class of Plug-in Hybrid vehicle, one meant to be driven primarily on battery power, that earns an appropriate level of ZEV credits. This class appears meant to fit the Chevy Volt, a plug-in hybrid vehicle with an all-electric range long enough to allow drivers to do most of their driving on electricity alone. 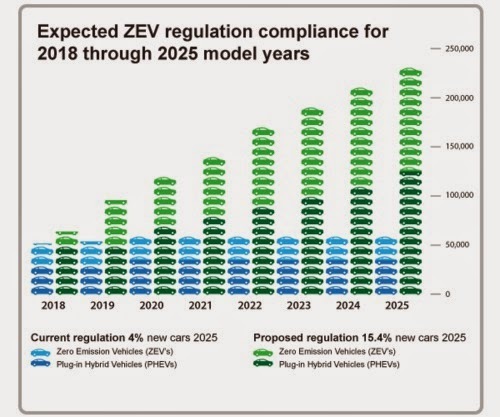 Starting in 2018 there are requirements of increased zero emission vehicle sales with a 2025 goal that 15.4% of new car sales will be ZEV’s and plug-in hybrids. This move is meant to increase sales and bring down the incremental cost of these vehicles. CARB projects that by 2025 owners of these new advanced clean vehicles will see $4000 in operating cost savings over the cost of the vehicle. As we’ve discussed before, the day-day operating costs of even today’s electric cars is far lower than equivalent sized gasoline cars. This comes because electric vehicles are far more efficient with energy than gasoline cars, plus electricity is less expensive than gasoline. In job growth CARB cites the existence of Tesla (headquartered in Northern California, and recently resurrected the NUMMI plant), Coda (headquartered in Los Angeles, with an assembly plant in Benicia) and Fisker Automotive (headquartered in southern California) as evidence that California will see job growth in this sector. 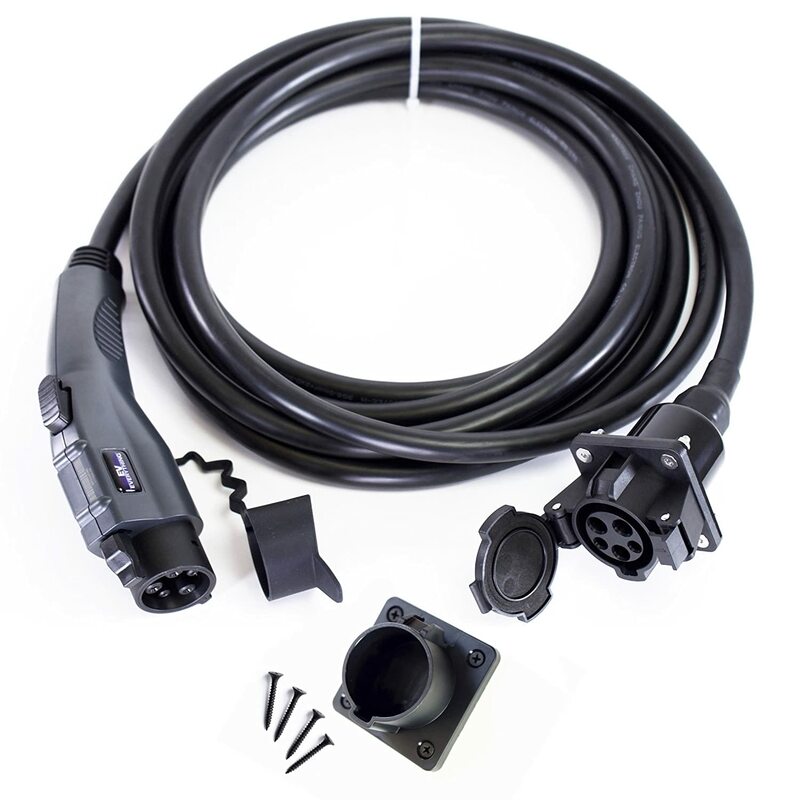 In addition to those companies there are several other electric vehicle component manufacturers based there, as well as Zero Motorcycles widely recognized as a worldwide leader in electric motorcycle design and manufacture. Recognizing that vehicle manufacturers will need sufficient lead time to implement the required changes, the phase-in of the Advanced Clean Cars program gives manufacturers this lead time. Indeed, several automakers such as Ford have said they recognize that governments around the world are aiming for ever-cleaner vehicle emissions regulations and that it’s better for the automakers to be out in front of the regulations, rather than being pushed by the regulations. Ford’s strategy is to have their own sustainability and clean vehicle roadmap allowing the company to reduce emissions on their own terms rather than being pushed by new regulations. CARB, EV Politics, ZEV. Bookmark.